The summer of 2009 was seen by many reds as the most promising summer of our recent history, and recent developments suggest that whilst the optimism was misplaced and short sighted, it was also very appropriate. Our league position at the end of the previous season was 2nd, with a record of P38, W28, D11, L2. Our points total was 86. The 2011 Barclays Premier League champions will probably achieve 78-82 points, showing just how good a season we had in 2009. Liverpool supporters were rightly optimistic during that cold, wet summer of 2009. Yes, we had lost three giants from the 2009 season in Alonso, Arbeloa and Hyypia, but we had brought in players to replace them in Aquilani, Johnson and Kyrgiakos. At the time, there was a consensus of opinion that Alonso was a massive loss, but he wanted to leave so let him go. Liverpool FC focuses on the here and now, nothing else. A new banner for Aquilani, “Il Principino”, was erected in the corner of The Kop. The mood was very much one of “onwards and upwards”. The bookmakers made Liverpool 11-4 second favourites for the league before the opening game of the 2009/10 season with Spurs. We lost that game 2-1 and from then on things started to crumble. The turmoil off the field was reflected on it. From October onwards, we never climbed higher than 4th place and ended the season 7th. Rafael Benitez refused to sign a contract in January 2009. A reported pay rise to £4m per year and full control over the transfer budget were agreed, but Benitez held out for one last concession: to take control of the academy from John Owens. Victories over Manchester United and Real Madrid within a week gave Benitez the perfect opportunity to strike his desired deal and the Liverpool board gave the green light for Benitez to implement a radical overhaul of the academy. 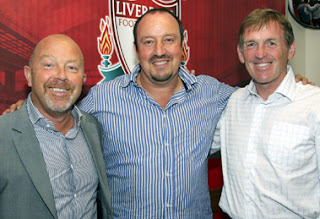 The future of Liverpool FC was finally alongside its present in the hands of Benitez. They say that from small acorns giant oak trees grow, and Benitez had just been granted the freedom to start fertilising Kirkby. Benitez brought in José Segura and Rodolfo Borrell from the Nou Camp to head up a team that would use the Barcelona blueprint for academy success. Segura and Borrell coached both Cesc Fabregas and Lionel Messi during their time at Barcelona's La Masia academy, developing a first team that many people are now calling the best ever assembled. Less than two years since the seeds of our future success were sown by Benitez, a vibrant young youth team is starting to make its mark on the world. This season has seen both the U18 and U16 teams really start to blossom. The U18 team are unbeaten since October and have been the subject of much media hype since the 9-0 demolition of Southend. They followed this up with a 4-1 win against Stoke in which Sterling hit a brace and Conor Coady smashed in a Gerrardesque volley. All eyes will be on them next Saturday as they face Manchester United in the Sixth Round of the FA Youth Cup. There is also much to get excited about within our U16 set up (some of whom also play for the U18s). In the latest England U16 & U17 squad, there are a total of 7 Liverpool players who are eligible to play for the U16s, comfortably the most of any club in England. The next best youth set up in terms of England call-ups is Man City with 5, who Liverpool beat 2-1 earlier this month thanks to goals from two of our England starlets, Sterling and Morgan. A look at the England Youth Squad competing in the 2002 European Championships tells its own story about what the future may (or may not) bring for these players. David Raven, David Mannix and Mark Smyth represented Liverpool in that competition alongside a certain Wayne Rooney of Everton. Smyth actually scored in the opening game against Finland. If you are wondering what happened to Smyth, he was released by Liverpool at the end of the 2004/2005 season, signed by Accrington Stanley and most recently played for Bangor City in the Welsh Premier. For me, this sums up our prospects at the Academy. 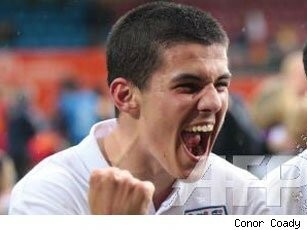 There will be a Smyth amongst the starlets but there just might be another Steven Gerrard in there as well. The acorns planted by Benitez in Kirkby in 2009 are coming along very nicely at the moment, but they need plenty of TLC and some will inevitably fall by the wayside. For everybody connected with Liverpool Football Club, we are watching and hoping for the giant oak trees to grow. The Chelsea v Liverpool game gave the biggest insight yet into what Kenny believes to be his strongest eleven and his best system. The key to winning the game was how we operated in midfield, completely stopping Chelsea’s front six from playing. 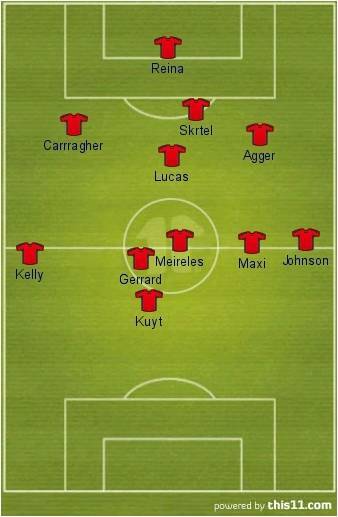 Lucas’ average position was directly in front of Skrtel, significantly further back than Gerrard, whose average position was actually in front of Meireles. Gerrard being this far forward when playing in central midfield would normally be a cause for concern, but against Chelsea he and Meireles were able to support Kuyt without leaving Lucas exposed. Since the Fulham game, where Gerrard played as the second holding midfielder in a 4-2-3-1, Kenny’s philosophy has been to allow Gerrard and Meireles the freedom to go forward without worrying too much about tracking back. Recent performances show that Gerrard and Meireles operate best when interchanging positions behind the lone striker. The key to their success is backing them up with either two holding midfielders (against Wolves) or a third central defender (Chelsea and Stoke). For the second time this season against Chelsea, the star man was Lucas Leiva. If Lucas continually improves season on season as much as he has this year, it will not be long before he is being talked about in the same breath as the likes of Claude Makelele, Gennaro Gattuso and Sergio Busquets. His talent has been recognised by Brazil where he has been given the No 5 shirt made famous by Dunga, Mauro Silva and Cerezo. After years of being a scapegoat, people are finally starting to see Lucas as he was seen by Benitez, but he has been on a tough journey to get his recognition. Coming into a Liverpool squad which contained Alonso, Gerrard, Mascherano and Sissoko had many fans scratching their head about why he was here in 2007. When he gave away a needless penalty and then got sent off in the derby at the beginning of 2009, he quickly became public enemy No.1 on the pitch. Possibly his biggest crime was that he didn’t stand out. In many ways he still does not. He is not an all-guns-blazing midfield terrier like Mascherano, and he does not play those 50 yard inch-perfect passes like Alonso (Gerrard at his very best does both). This has inevitably led to questions being been raised about what Lucas actually does. Makelele came in for similar criticism at Real Madrid. When he left, President Perez was quoted as saying, “We will not miss Makelele. His technique is average, he lacks the speed and skill to take the ball past opponents, and ninety percent of his distribution either goes backwards or sideways. He wasn’t a header of the ball and he rarely passed the ball more than three metres.” This quote could easily be a fans forum post about Lucas back in 2009. It was 2010 when Lucas finally started to get recognised. The Mascherano brand of hard tackling midfielder is being stamped out across the game, illustrated by the fact that “Mascha” had the Premier League’s worst disciplinary record last season with seven yellow cards and two red. In the modern day game “intercepting” is the new tackling. When you intercept you stay on your feet and there is no risk of a foul or booking. Intercepting a pass gives the best possible opportunity for launching a counter attack. Fortunately for Liverpool, interception is one of Lucas’ specialities. Against Chelsea, Liverpool made 26 interceptions and Lucas was responsible for 5 of them, 20% of the team’s total. His pass completion rate of 89% is made even more impressive by the fact that, of his 45 passes, 30 were forward balls. This proves that he is not the “90% back or sideways” passer he has been accused of being. Whether we continue with the 3-5-2 formation or revert to 4-2-3-1, Lucas will be as pivotal a player for us as Busquets is for Barcelona. Whilst one of the attacking players will always get the man of the match from Sky Sports, or the Alan Shearer treatment on MOTD, it will be Lucas who acts as the fulcrum of the team, marshalling the defence and stopping attacks before they have a chance to start. (With thanks to @AnfieldIndex for the stats). Can Luis Suarez eclipse Carlos Tevez as South America’s best Premier League striker? Luis Suarez has been favourably compared to Carlos Tevez by many observers, including Suarez himself. Looking at the way Tevez demolished West Brom this weekend, there is plenty of room in the Premier League for a player who can emulate him. For Liverpool fans, though, emulation is never enough. We demand greatness from our No. 7s. Suarez himself cited Tevez as the catalyst for his desire to play in England, "When I see the way that Tevez plays there I think I can be a big name in England. It's because of the energy, and the spirit they put into the game in England. Now, I think it's a kind of football that suits me." Suarez’s first flirtation with greatness came at his native club, Nacional. He joined as an 18 year old in 2005 and scored 10 goals in 21 appearances to fire them to the domestic title. His next move personified a man with total confidence in his ability and a fearless nature. He entered Europe via the Netherlands and Groningen. The 19 year old could not speak a word of English or Dutch, so let his football do the talking. In analysing how well he did there, you only have to look at who came knocking for him next: Ajax. He signed for the masters of Dutch football after just one year in Eredivisie, aged 20. Suarez became an instant hero at Ajax, scoring one and setting up three in an 8-1 demolition of De Graafschap on his debut. A brace in his home debut set him on course for a very respectable 22/44 for his first season in Europe. By contrast, Tevez chose to spend his early career in South America. As a 17 year old for Boca Juniors he showed his potential without ever being prolific in front of goal. However, his time there convinced Corinthians to part with £13.7m in 2005 for the 20 year old. It was the biggest ever transfer in the history of South American Football, funded by Kia Joorabchian’s Media Sports Investments. The faith shown in Tevez by this transfer fee was soon rewarded as he fired 31 goals in 47 games for them and became the first non-Brazilian to be named footballer of the year since 1976. By the age of 20 Suarez and Tevez had chosen very different career paths but with similar success. The goals Tevez has scored in England combined with his work ethic and a never-say-die attitude have enabled him to become a hero on both sides of Manchester over the past three years. On top of that, it must not be forgotten how he single handedly kept West Ham United in the Premier League in 2007. Throughout the same period, Suarez has scored 81 goals in 110 games for Ajax, demanded and received the captaincy of the club at the age of 22 and joined the likes of Cruyff, van Basten and Bergkamp in their “100 Club”. He also kept his native Uruguay in the World Cup “single handedly” with a great save against Ghana. In terms of their style of play they are remarkably similar and all of the signs point towards Suarez being a big hit in the Premier League. They both have the opportunity to become the greatest South American this country has ever seen. Only time will tell which one of them will take it. If you ask Steven Gerrard for his best position, he will probably tell you that it is central midfield. It was as a central midfield powerhouse that Gerrard first burst onto the scene, but under Rafael Benetiz Gerrard often seemed to play anywhere but this position. So, where is Gerrard's best position and how will Kenny get the best out of his Liverpool captain? Gerrard has so far played two full games for King Kenny. In analysing the first game against Fulham, there are questions to be asked about his positioning. Gerrard played alongside Christian Poulson in central midfield and his display indicated that, after years playing further up the pitch or out on the right, he does not have the discipline to play this role. Gerrard came out of the blocks like a steam train, heavily involved in wave after wave of attack. During this initial ten minute period, Liverpool created lots of chances and had a goal wrongly disallowed. Then Gerrard seemingly started to tire (he was physically panting after ten minutes). For the rest of the game, neither Gerrard nor Liverpool looked the same. Gerrard personifies the way Liverpool play: when he is firing we are firing, when he is sluggish we are sluggish. Gerrard’s positioning was a concern all game. When the ball arrived in central midfield area Gerrard was often out of position, leaving Poulson wide open to a Fulham attack. Fortunately, Fulham were poor and did not capitalise on the space they were gifted by Gerrard. On a couple of occasions he played defence splitting passes that very few players in the world can play, so the role of midfield playmaker is definitely within him. The challenge for Kenny is, given Meireles' form and the introduction of Carroll and Suarez, where he plays Gerrard if it is not in a central midfield two. With the disciplined Lucas and quick minded Aurelio playing behind Gerrard, he was given the freedom to interchange with Meireles as the second striker. It also allowed him to drift right and deliver the sort of penetrating balls into the box that would have had Carroll’s mouth watering from the director's box. The question for Kenny now is how he fits Gerrard into an attack encompassing Carroll, Suarez & Meireles. 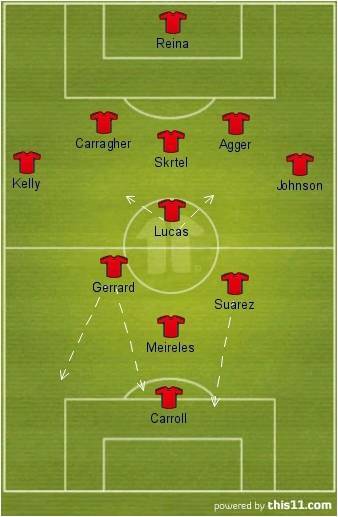 Looking back on our recent history, the Mascherano – Alonso – Gerrard central midfield partnership worked really well, and a similar formation could work with Lucas – Meireles – Gerrard. The key player for me in all of this is Steven Gerrard. Getting Gerrard firing on all cylinders could make or break the second half of our season, and here lies Kenny's Conundrum.